She was mad at me and yet, I just love Carolynn. You see, I helped her “Charge Neutral” and now her unfaithful husband is begging for her to take him back. Dear Dr. Bob – I’m not happy with you! After all this work I have done – religiously, I might add – and down to the letter – I have discovered myself! When we broke up I swore I would never love again, and that I could never be happy again. Every time I saw him, I died inside. I cried myself to sleep at least ½ of the past two months! As crazy as this may sound – I wanted to always hurt for him – always be sad – because that way, he may come back to welcoming arms. But, alas, no thanks to you, I saw him yesterday and didn’t ache, didn’t hurt, and didn’t cry afterwards! What have you done? Where is the sting I had gotten so used to? Please explain to me why I have a new self-esteem without him? Tell me how to get back the hatred, the anger, and the frustrations of rejection – because without those emotions ruling over me apparently I have become attractive again. I didn’t want to fall out of love with my husband – I mean, yes, he broke our vows, cheated, lied, and harbored secrets – but he was mine. He was not his to give away to someone else – I owned him! Your program has had me seeing myself and my values in a whole new light. And, I swear, ever since I discovered that my values were conflicting with his – and because I wouldn’t compromise on my spiritual values, my personal values, and my intimacy values – you made me see that the internal conflict was causing a mess. I have discovered a peaceful calm, new love, and a healthier me – I didn’t pay for this! When I saw him yesterday, I said to myself, “What was I thinking? I must have been desperate as hell to hook up with him!” So, I am angry because I paid for your books in order to keep him and now I don’t want him and he is begging me to reconsider our marriage! Hmph!! Would you like Carolynn’s problem? Charging Neutral is just one (although users say THE most POWERFUL) of 16 skills and strategies I teach and introduce in the 48 Hour Infidelity Boot Camp. Also, and this is CRITICAL: what strategy or skill you use depends on the type of affair facing you. 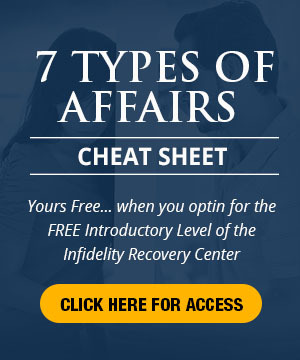 I’ve outlined the 7 Types of Affairs in the 48 Hour Infidelity Boot Camp. The 48 Hour Infidelity Boot Camp will open your eyes to your spouse’s motives for the affair and kick start your healing and change process. The Boot Camp contains a wealth of other information, but for now, I want to emphasize the importance of pinpointing the type of affair and employing a strategy that fits that affair, in conjunction with Charging Neutral. But, let’s go back to Charging Neutral; a skill or mindset that compliments and enhances the power of the other skills and strategies. It is important to Charge Neutral in all 7 Types of Affairs. Each affair demands a different “shade” of Charging Neutral. Knowing when to “shade” Charging Neutral assures success and colors the future of your marriage or relationship. Become an expert in Charging Neutral and the 7 Types of Affairs and your spouse will strain their neck trying to keep an eye on you, because you no longer play THE game. Carolynn followed through on learning the 7 Types of Affairs, felt the relief from knowing the infidelity was not her fault, targeted EXACTLY what she needed to say and do, Charged Neutral and now she has a dilemma – what to do with a radically changed relationship. Maybe this will be your outcome, maybe not. But, I guarantee you will have the potential to feel worlds better, will see the folly behind the infidelity and will chart a course that gives confidence and purpose. Now, if you want to experience this power and want to begin leaning in this direction, I offer a beginning point. 1. You will receive Carolynn’s Manifesto (her list of 18 goals) in your email box. Print out the Manifesto, tape on your fridge, bathroom mirror, etc. You will receive emails introducing you to other important steps in the Infidelity Healing Process. 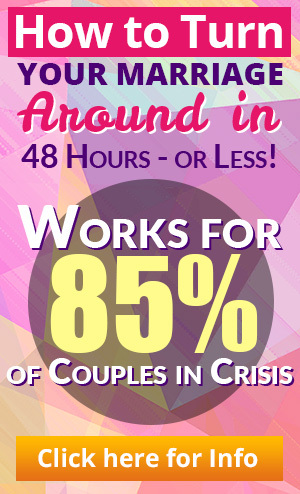 Please sign up for the 48 Hour Infidelity Boot Camp and calm your hurt and fears. Keep your eyes on your email inbox with emails from Dr Bob Huizenga. Infidelity throws your feelings, your life and your family for a loop; a painful confusing loop. You can trust that I offer you, step by step, what you need. I’ve spent 3 decades as a Marriage and Family Therapist, counseling thousands and want you to pull as much wisdom as you possibly can from my experience. This entry was posted in Charging Neutral, Uncategorized and tagged how to make your spouse want you. Bookmark the permalink. How do I obtain the vocabulary and communication skills I need to communicate in charging neutral, and not only in charging neutral but every day communication. It’s so hard trying to remember don’t say things like this or that, I try to communicate and it’s turned around on me and I’m called selfish I shut down because I’m at a loss of words. My self esteem is so low!!!! I’m always left with a punch in the gut and my mouth open! One of my knee jerk reaction is to withdrawal cry for days behind close doors. I did it this morning after seeing a text pop up from her, I withdrew said good morning and walked away with my head down like I done something wrong.